The above patient had several anesthetic free dental cleanings. What do you see in the first image? Can you see what the veterinarian sees? Can you see what is happening in the soft tissues and bone under the gum line? Your veterinarian cannot which is why anesthetic is needed to diagnose what is going on. Treatment is based on an accurate diagnosis. Diagnosis and treatment needs a very still patient which has good pain control. In the patient above, while the crowns of the teeth appeared cleaner there was much disease missed in the bone and tissues around the teeth. Please remember that a teeth clean in dogs and cats is different to what your dental hygienist is giving you during your teeth cleans. Your hygienist is cleaning teeth that are at an earlier stage of periodontal disease which is why it does not really hurt you. Animals are usually in advanced stages of periodontal disease and are in a lot of discomfort and pain – many try to hide it, others snap, bite or flinch. Patients under anesthetic can be woken up due to the terrible pain they are in which is why veterinary dentists give local anesthetics and use multimodal analgesic protocols to reduce this pain. Non anesthetic dental cleanings are not gentle and are not pain free. Please do not underestimate this pain. Your pets are usually very polite to you. White crowns do not mean that the tooth is clean -how are the roots – this is where the pain is in periodontal disease. Loss of teeth over the years despite the anesthetic free dental cleanings because the disease deep under the gum line is not addressed. The cost of the procedure each time it is performed. 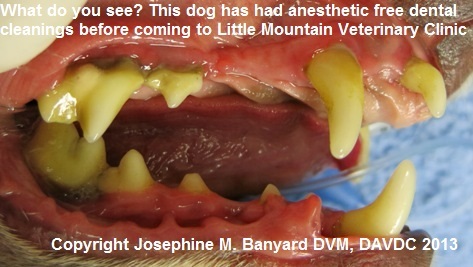 Please spread the word to your friends and relatives to see your veterinarian about the oral health of your pet. It is good medicine to have your pet anesthetized for the teeth clean. The teeth must be X-rayed to see what is happening in the bone. At Little Mountain Veterinary Clinic Dr Banyard shows you the images and the X-rays of your pet’s mouth to make sure you know what is happening to your pet. If you do your part of daily brushing your pet’s teeth inside and outside the mouth and take your pet in to see your vet for regular teeth cleans under anesthetic you will ensure your pet has a healthy and comfortable mouth for it’s life time. If your pet’s gums are red do not brush the teeth as they are sensitive. For more information please refer to Healthy Mouth, Healthy Pet: Why Dental Care Matters. Available at Amazon, AAHA and VIN book stores.